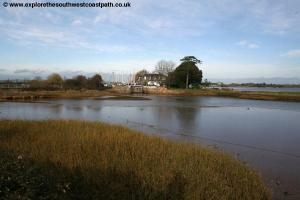 This walk is not all part of the South West Coast Path as between Exeter and Starcross it is part of the Exe Estuary Trail, a pleasant walk around the Exe from Dawlish to Exmouth via Exeter and joins the coast path at Starcross. 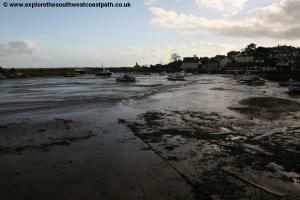 It is a natural extension to the coast path and is a scenic and fairly easy walk. Starting from the historic city of Exeter, this walk follows the Exe Valley Trail alongside the Exeter Canal and the River Exe. As you head out of Exeter, the canal re-joins the river at Turf Looks where the river becomes wider, opening into a large estuary as it approaches the sea. 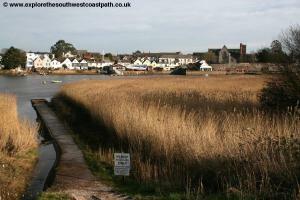 The path passes Powderham Castle before joining the official coast path at Starcross. 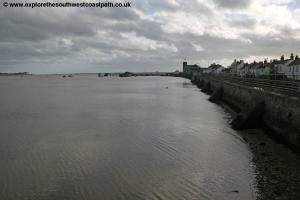 From Starcross it is an easy walk to the popular resort of Dawlish Warren, passing Cockwood Harbour on the way. 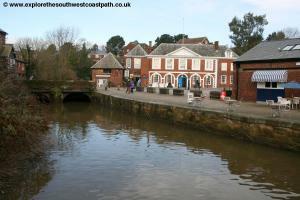 There is some road walking involved within Exeter city centre, around Powderham Castle and between Starcross and Dawlish Warren, though there are footpaths on a lot of the walk. 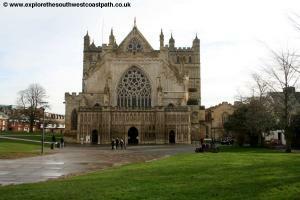 Exeter is very easy to reach, with good road links to the M5 motorway, A30 and A38. There are plenty of car parks in the city centre, which are a short walk to the riverside and also one close to the Quay (Cathedral and Quay car park), which is the closest for this walk. There are also park and ride services available at Sowton, Matford and Honiton, which are well signed. If you're using public transport, there are fast and frequent train services from London (Waterloo and Paddington), Salisbury, Bristol, Cardiff, Plymouth and Birmingham to Exeter, as well as longer distance services from the North and Scotland. There are local services to Exeter from Torbay, Exmouth, Barnstaple and (on Sundays only), Okehampton. 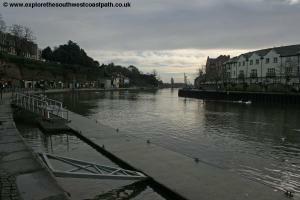 This walk can be started from either Exeter Central or Exeter St Davids stations. 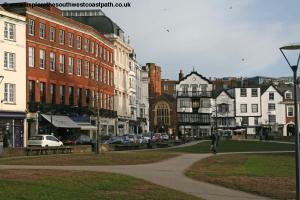 There are frequent local and long distance bus and coach services to Exeter. Exeter has a good range of Hotels and B and Bs. There is a tourist information centre in the new Princeshay shopping centre which has information on all the hotels in the area. The link below provides information on accommodation in the area. 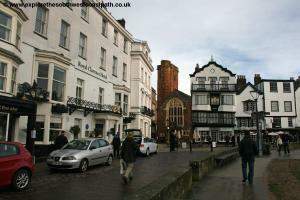 From the High Street in Exeter head down to the cathedral green, which is well signed. This is a beautiful location, and rather more peaceful than the busy High Street nearby. Here the magnificent Cathedral is surrounded by historic buildings and a large green. Pass the front of the Cathedral on your left and head down the private road alongside the front of the cathedral. This comes to a little car park where you turn left, with the road. This is called Bear Street and soon forks to the right where it becomes Palace Gate. Here cross the busy South Street via the pedestrian crossing on the right and then head along Coombe Street, which is opposite South Street. This takes you in a subway under the busy A3015. Once under the road you continue on the path beside the Cathedral and Quay car park on your left and when the path forks turns right down the steps. This soon brings you down to the busy and attractive quay area. This area dates from when this was a busy port, with good unloaded on the quay here and fees paid at the attractive custom house. Today the area is very much leisure orientated with craft shops in the arches along the river and shops, bars and cafes in the larger warehouse buildings. On reaching the waterfront turn right with the water on your left to cross the bridge adjacent to the old Mambo nightclub. 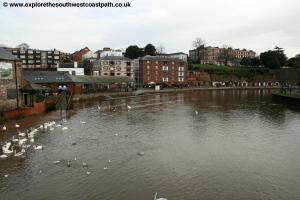 Then take the path up that leads to the footbridge over the Exe, already quite a wide river. Here turn left now with the river on your left passing along the river side. On the left you soon come to the old cable-hauled ferry, Butts Ferry, which also crosses the river here. After the modern houses on the right where it opens into a square you can see the basin of the Exeter Canal, now an attractive leisure area with boats moored alongside the canal. 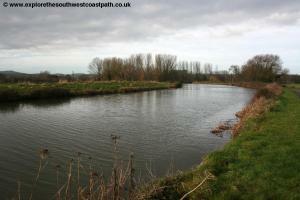 This canal can be used by ocean going ships to reach the centre of Exeter and joins with the River Exe further down stream, as the Exe itself is not navigable due to the construction of Countess Weir. The river bank soon becomes wooded although unfortunately you may find this part of the path rather smelly as you pass the incinerator on the other side of the canal. You soon come to a small car park at Salmon Pool where there is a bridge to the right which crosses the canal. Ignore this and continue straight ahead along the path, which now has a minor road running alongside. 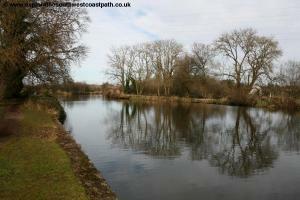 The canal again has woodland on the left here for a short while, before giving way to open grassy fields. Continue on the path to soon reach the Double Locks pub. 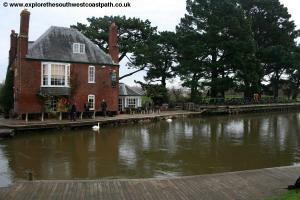 This is a popular riverside pub on the banks of the river and there is a large river basin here too. At the pub here you need to turn left briefly away from the canal on the tarmac track that runs alongside the pub, which you now pass on your right, with itÃ¢â‚¬â„¢s car park below you on the right. 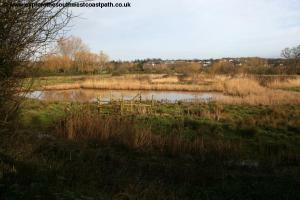 This soon rejoins the north bank of the canal which now has an area of marshes on the left, and there are a couple of viewing points to view the birdlife on the marshes to the left. Soon you are approaching the Countess Weir swingbridge and so the traffic noise increases. Here as the path forks take the right most fork still beside the canal, on your right. 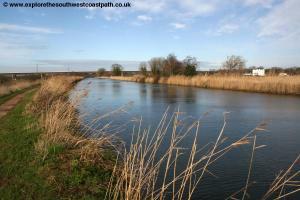 Soon this brings you up to the busy A379 road which crosses the canal here. This was built as a swingbridge so that large boats could still get into the canal basin in the centre of Exeter, but it is rarely lifted now. On reaching the busy road, cross via the pedestrian crossing and then turn right and then take the footpath down on the left back to the canal, now on the south side of the canal, with the water to your left. You now follow this pleasant path beside the canal for around 1.5 miles as the sound of traffic soon gets louder as we near the M5 motorway. Soon pass under the M5, which goes high above the river and continue for around another mile along the canal. 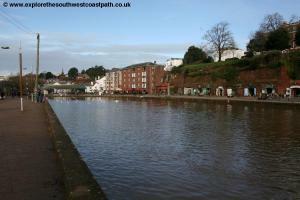 Soon you reach the old Topsham Lock on the left, which provided access into the main channel of the Exe. Just beyond this is the Topsham Ferry. This ferry still runs and provides a regular crossing (on demand) to the pleasant quayside town of Topsham on the other bank of the river. You also get fine views of the Exe here. There is a lock and bridge over the canal here, but continue on the same bank of the canal to head south along the canal, which is now protected via a very thin strip of land between the canal and the large Exe on the left. The pleasant town of Topsham can be seen to the left. 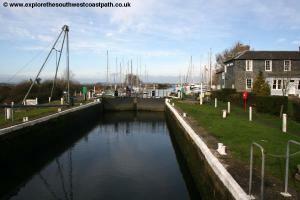 You now follow the canal south for around 1.5 miles to reach the popular Turf Lock Hotel. This is a large pub with a large beer garden in a wonderful location and is very popular in the summer. The pubs garden has water on all sides, with the wider Exe to the left and the canal to the right. 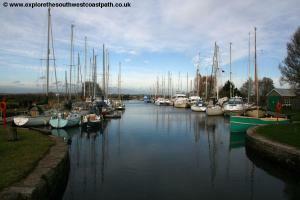 The canal also widens into a large basin here, with boats moored on both sides of it. This is a pleasant place and worth a stop. The Turf Lock marks the point the Exeter Canal reaches the wider river Exe which is naviagable south of here to the sea. 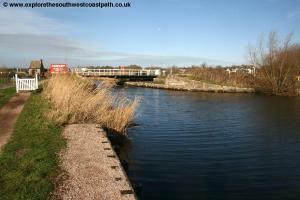 The path now runs along the river on a raised wall with the railway line close by on the right, where the main-line trains run to Torbay, Plymouth and Cornwall. 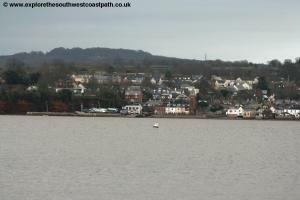 The villages of Exton and the Royal Marines base at Lympstone can be seen on the other bank of the river. After around 3/4 of a mile the path comes to a crossing of the Great Western Railway and unfortunately from here for the next couple of miles, rail passengers get a much better view of the estuary than we do! Cross the crossing here with care, checking for trains coming first, as there are no lights or barriers to help crossing. Once over turn left and keep to the track parallel to the railway line, which can be boggy in places. 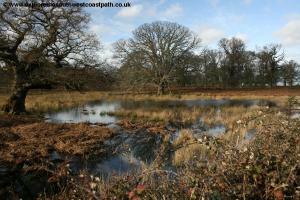 This soon comes to a minor road which runs around the Powderham Castle estate and park on the right. This is the home of the Earl of Devon and the castle is situated in large gardens with a deer park and you may see some deer from the road. 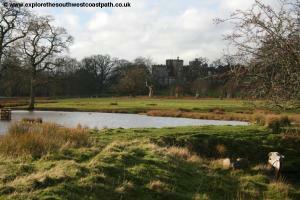 The castle and some of the grounds are open to the public during the summer months. The next mile and a half or so is along this road, which lacks a pavement, so care is needed. 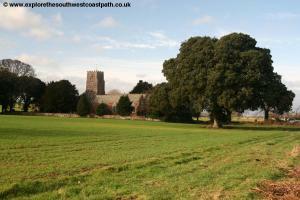 Thankfully it carries very little traffic being mostly traffic from the small Powderham village. 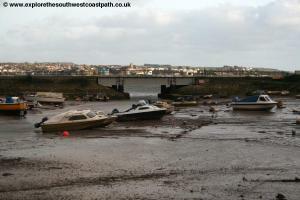 The path passes Starcross Yacht Club on the left. A few places along this road there are steps up onto the railway line on the left, which you can cross and get to the estuary itself to take in the wonderful views, but ensure you check for trains coming first before you cross the tracks. After around 1.5 miles the road turns right a little way back from the river. Just before this meets the busy A379 you turn left on the signed footpath and cycle path. 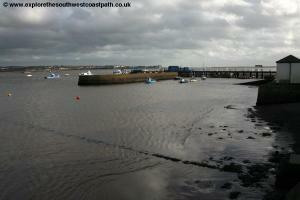 This takes you back alongside the railway line and river as we approach Starcross. Pass a car park on the right and continue south along the road to soon reach the railway station. This is a good place to break the walk if you've had enough as there are trains (typically hourly) here back to Exeter usuaully calling at Exeter St Thomas, Exeter St Davids and Exeter Central. In addition regular buses run to Exeter. 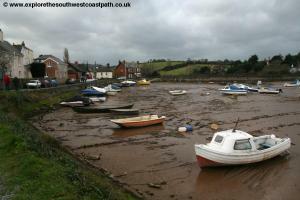 During the summer there is also a ferry from Stracross to Exmouth on the other side of the estuary. 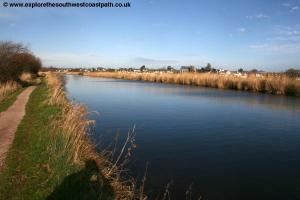 Assuming you continue the walk keep to the cycle path heading south along the road. As soon as youÃ¢â‚¬â„¢ve passed the station building this turns right along Bonhay Road. Take the first road on the left here, Well Street. At the end of Well Street cross New Road and go more or less straight on along Courtenay Terrace. Turn right at itÃ¢â‚¬â„¢s end into Church Street and follow this as it turns left and becomes Royal Way. Continue on this route back to the A379. Presumably this (signed) route was put in place to minimise walking next to the busy A379. Turn right on the road here, which still has a pavement . As we near Cockwood there is a parallel path next to the road which you can take, avoiding the road walking here. In Cockwood the A379 runs along the north of the harbour but continues west, we turn right now on a more minor road around the back of the harbour. This road lacks a pavement however but does not have so much traffic. There is a pub at Cockwood overlooking the harbour. 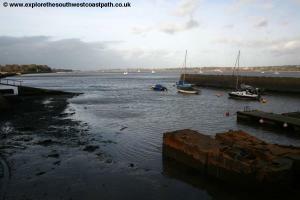 The small harbour here can only be accessed via a narrow bridge under the railway and is tidal meaning it is empty of water except near high tide. 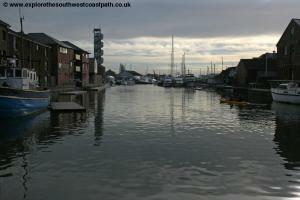 Follow the road along the west and south edges of the harbour and then continue on the road south. Care is needed as there is no pavement but thankfully a narrow pavement soon starts on the left. Again there are a couple of steps up onto the railway line which you can cross to get down to the estuary to enjoy the views, now with the town of Exmouth opposite and the coast beyond. 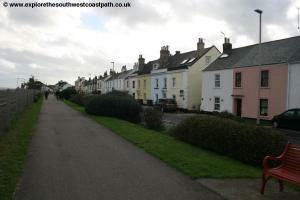 Continue with the road as it forks a little away from the railway line and coast to the small village of Eastdon. As you reach the village a new cycle path has helpfully been constructed alongside the road, meaning you can avoid the road walking here. 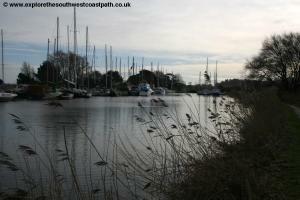 This runs parallel to the road on the estuary side of the road. As you near the end of the village it crosses the road and continues for a short distance on the other side of the road. 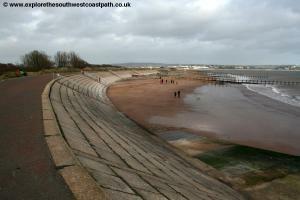 It then soon comes out alongside the road beside the caravan parks that mark Dawlish Warren. You now follow this road south past the numerous holiday parks and caravan sites that line the road until you come to the junction with Beach Road. Here fork left to the beach car park (which also has toilets). Take the narrow road under the railway line here, which is traffic light controlled and has a narrow pavement alongside. This now brings you out to the sandspit of Dawlish Warren, a sandy beach at the mouth of the Exe Estuary. To get back from Dawlish Warren, trains run broadly hourly back to Exeter. Most trains stop at Exeter St Thomas, Exeter St Davids and Exeter Central giving you a choice of destination. As well as the train, Stagecoach bus service B runs hourly back to Exeter. 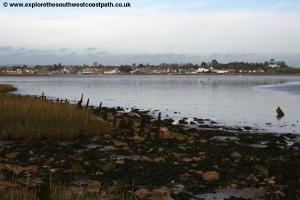 Ordnance Survey Explorer maps 110 (Torquay & Dawlish) and 114 (Exeter & The Exe Valley) cover this part of the coast path and Exe Estuary Trail. They are available from bookshops and other stores locally and larger book shops nationwide. In addition they are easily available from online retailers. The following links also show the maps of this area.